If you have been following my progress with the latest rebuild, you know I left off at the point of measuring the gaps in the rod bearings. 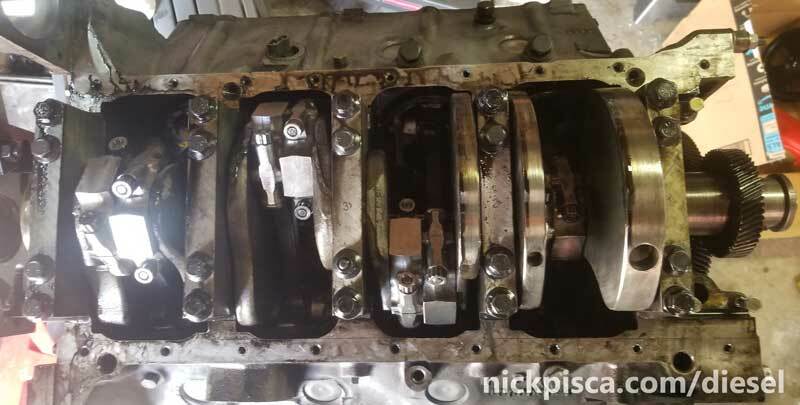 I got the crank mains measured and successfully installed the new crank in the ’94 block. Next I need to verify that all rod bearings are within spec as well. 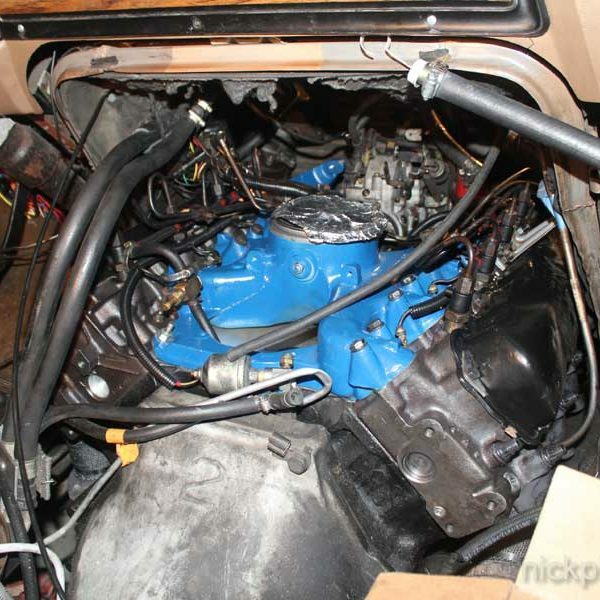 For the uninstallation of the pistons and rods, check the aforementioned link for all that prep. 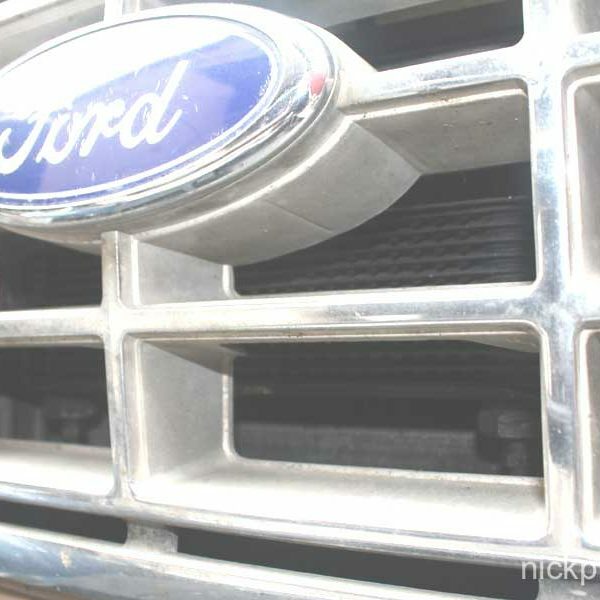 Removal is pretty simple, just undo the cap nuts and pry off the rod caps. Then push the piston out of the top of the deck. Lucky for me, I measured my pins with my schnazzy new calipers and they were both within three ten-thousands of each other. That is effectively an identical diameter, so either the ’94 or the ’88 pins would be usable. I elected to go with the ’94 pins, just because I’m going with the ’94 pistons, so I know they nested in the piston already. I laid out the pistons and their respective partners from the opposite engine. 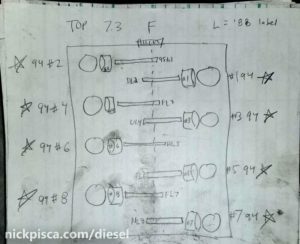 My drawing above explained which rods went with which piston. The process is pretty easy: using a needle nose pliers, I pulled out the pin retainers and pushed out the piston pin through one side. 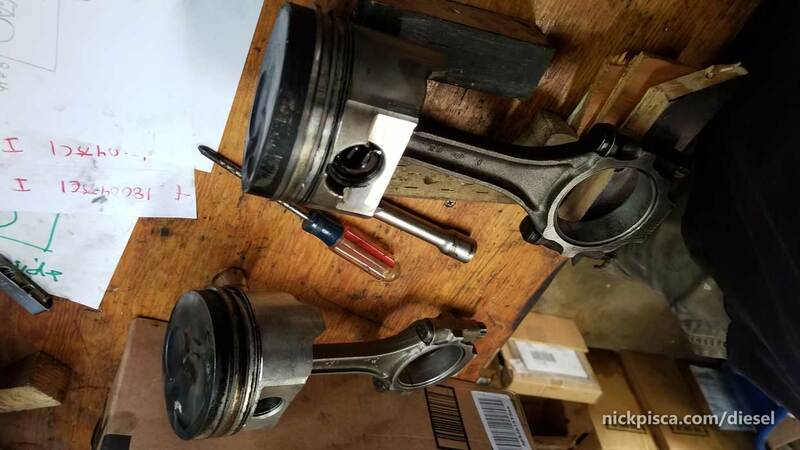 Then I carefully made sure the pistons were oriented the exact same way (using the rod letters and the piston pre-cup depressions as guides), and swapped the rods. Using a lint-free towel, I cleaned the pins and journals, and then applied some clean new engine oil to the surfaces to make sure they are properly lubed. Installing and Measuring the Rod Bearings. With the pistons and rods properly swapped, I archived the ’88 pistons and ’94 rods, and took the good rods and pistons to the vice. 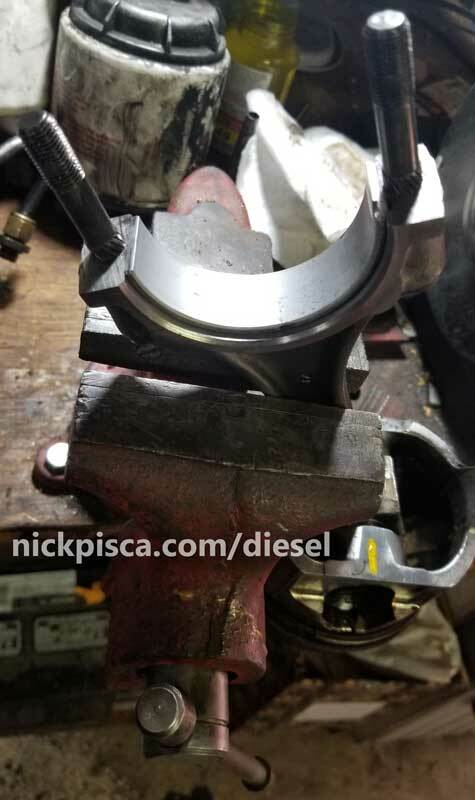 Careful not to damage the piston, I mounted the rods in the vice to have the bearings sized. When doing a bearing project, you will need to order new bearings. Bearings come in various sizes, based on the machining of the crankshaft journals. The only way to get a ballpark figure on ordering a new set, is to flip over the bearings in the rod and cap, and read the text on the back. 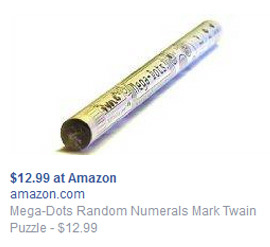 Typically, they come in “Standard,” “0.010,” “0.020,” and “0.030” oversized. As the crank journals are ground down in machining, they are sized in increments of ten thousandths (one hundredths). The purpose of the bearing is to make up this difference. Unlike the crank bearings, the rod bearings do not have an “UPPER” or “LOWER” designation. I ordered a set of 0.010 oversized bearings for my rods a while ago, and I’m now ready to install them. The old bearings slide out pretty easily. I cleaned up the rods and caps, removing any oil or grime that might have coated the mating surfaces. Then, WITHOUT APPLYING ASSEMBLY LUBE OR OIL, I installed the replacement bearings in the rod and cap. Dry. Also, there is a notch and key in the bearing that needs to line up. Then I put the cap on, and torqued the rod cap nuts down to the proper spec: 38 ft-lbs on the first torque, then 51 ft-lbs on the final pass. With the cap properly torqued on, it now is compressed into the size for operation. 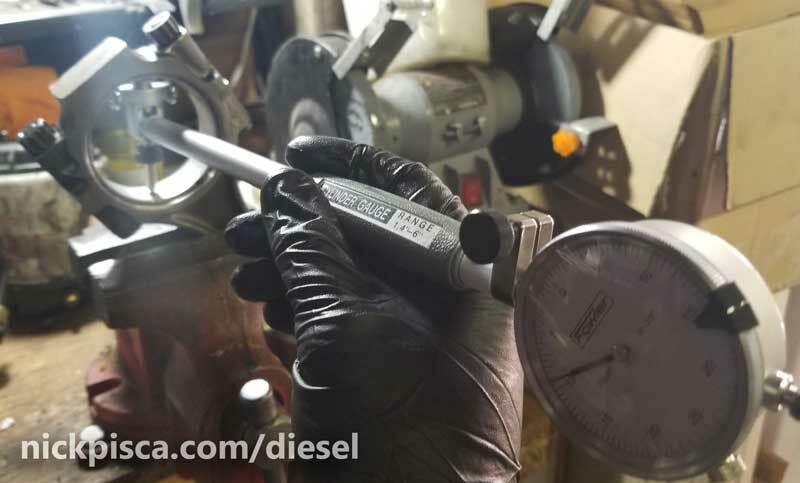 Using a bore gauge and micrometer, I needed to make sure that the bore conformed to the proper dimensions. 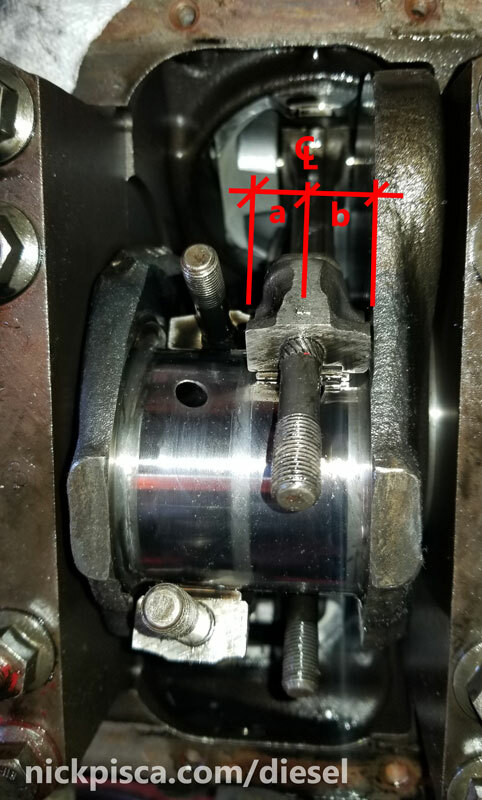 I had already measured the crankshaft journals when I did the crank bearings (explained in the other article), and wrote down the dimensions accordingly. All of the rod journals measured between 2.4882″ – 2.4885″ in the X and Y direction (of course the x and y are arbitrary because the rod rotates, but you get the point). 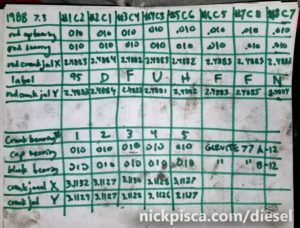 If your journal size is worn in between these increments, a machine shop will be needed to grind the journals to the next smaller undersize dimension. Then, the bearings will need to make up that hundredth of an inch. Knowing the ’88 crankshaft standard journal size is approx 2.4882 inches, I set my bore gauge to that value. Considering that this is about 1-3 ten thousandths of an inch deviation from the other journals, then it’s a good base point to begin from. 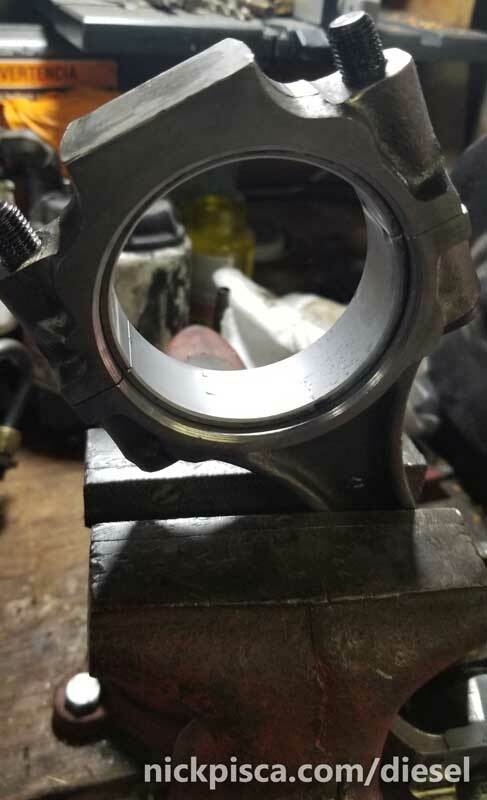 Then, the spec says the Main Bearing gap needs to 0.0018′-0.0046″ and the Rod Bearing gap needs to be 0.0011″-0.0036″. 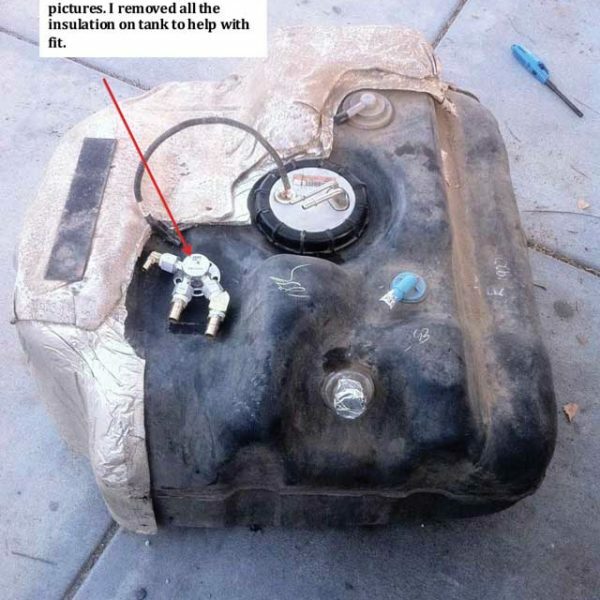 Too small, and the oil will not flow in between the bearing and journal. 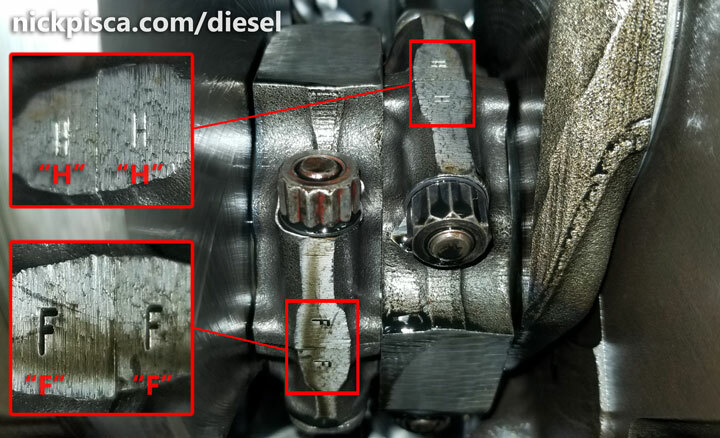 Too big, and the lack of resistance will let the oil lose pressure, so the 11 to 36 ten-thousandths is crucial to a successful engine rebuild. One by one, I clamped the rod into the vice, cleaned the surfaces, installed the bearings, torqued them to spec, and measured the bore. All were within 1.25-2.75 thousands of an inch, which is well within spec. Once they were all verified, then I disassembled everything (again) so that I could put them on the crank. Before I could do that, I had to do the Piston Ring work. I’m not going to detail that in this article. 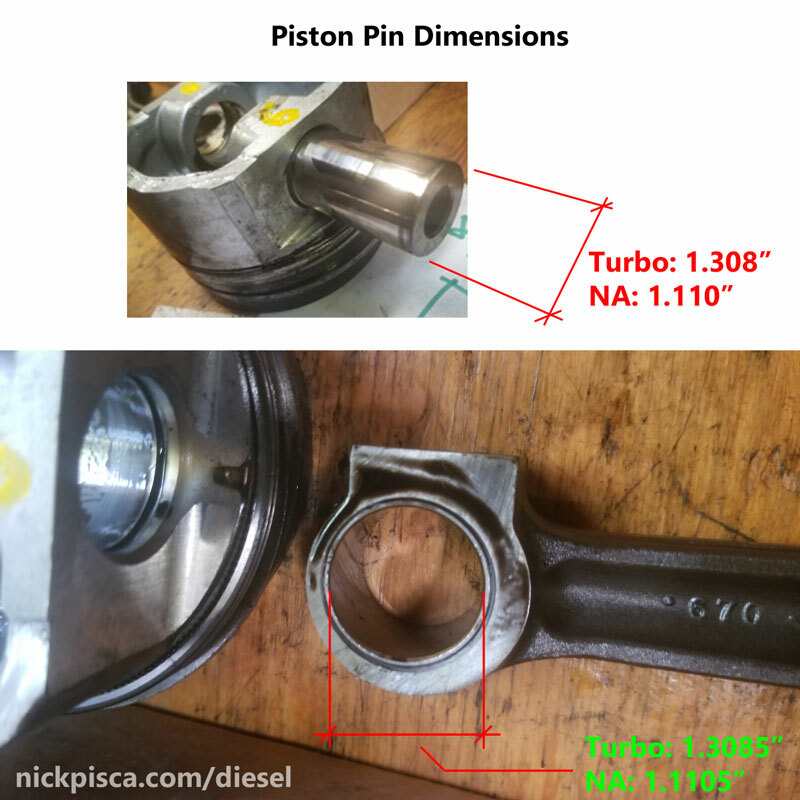 Here is a more detailed process of how I dealt with the piston rings, but to quickly summarize, it involves custom grinding oversized rings down to just under the Ford spec (long story), and using a piston ring compressor tool, a mallet, and some rod bolt covers to pound the piston-rod assembly into the cylinder. 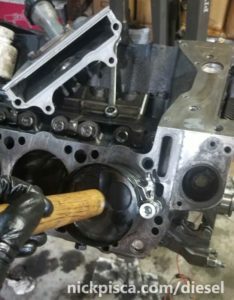 Before I put the assembly in the block, I coated the newly installed rod bearings with assembly lube or engine oil, because it’s a lot harder to reach around the crankshaft to properly lubricate the mating surfaces. With the pistons reinstalled in the block, I carefully positioned the rod bolts around the crank journal. Scratching the journals on the crank is not an option, so a pair of rubber vacuum hose around the threads is added insurance. Also, having a partner help out makes this job a lot easier, but I had to do it on my own. When capping the rods, makes sure the piston is oriented properly (the precups should be on the top-most side of the cylinder) and the rods identification numbers match together. Once all the rods and pistons are installed and aligned properly, I coated the cap bearings with engine oil and then capped the rods. 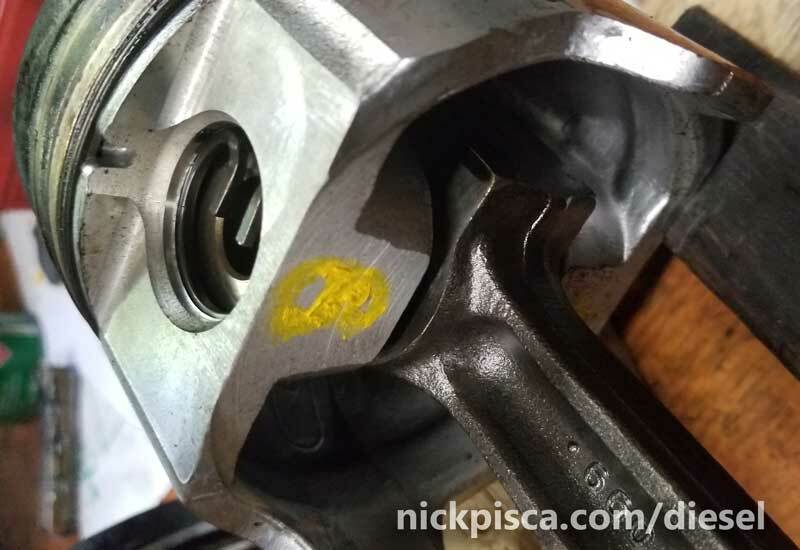 Also, as stated above, make sure the piston is oriented the correct way before torquing the rod nuts and caps down. I torqued the nuts to 38 and 51 ft-lbs in that sequence. As I worked my way down the shaft, I rotated the crank to give me optimal torquing access. Also, by turning the crank, I can make sure I didn’t mess up my micrometer and bore dimensions, and it hasn’t seized the rotation. 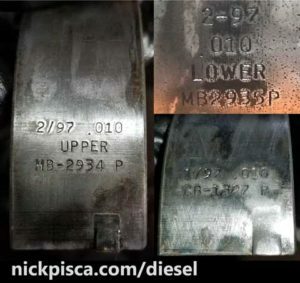 A lot of guys will use Plastigage to verify that the gap specs were correct. But with my bore gauge and micrometer going down to ten thousandths of an inch, I’m confident it was fine.